Comfortabel, veilig appartement met balkon, gelegen in het Negril Beach Club complex. Direct aan het strand. Vierentwintig uur beveiliging. Condo heeft een slaapkamer met 2 full-size / tweepersoonsbedden. Kan 2 tot 4 gasten tegemoet komen. Gunstige locatie, op loopafstand van winkels, restaurants, bars, apotheek, spa / fitnessruimte, dokterkantoren. Nachtclubs - een korte taxirit weg. De condo unit is uitgerust met wi-fi, kabel t. V. En telefoon waarop u oproepen kunt ontvangen van vrienden en familie. Een comfortabele residentie waar u zich thuis voelt. Ideaal voor singles, koppels en gezinnen. Alle welkom. The house was very clean, very well located, safe with a guardian, spa, pool, restaurant! All that is needed to have a nice relaxing time! Great location, Nice property, Would stay here again. My family of 4 found the condo to be very nice and clean and comfortable, the bathroom looks like it was recently updated. A/C in the bedroom and main room kept us cool and comfortable. The drive is about an hour and a half from the airport but its worth it. The kitchen has everything needed to cook if you feel the need to do so. It has a full size stove/oven, microwave and toaster. There is a nice balcony with a view of the swimming pool and the beach is just beyond that. There is a security guard at the front and back of the property so you don't have to worry about safety there. The property is right on the beach. The beach is beautiful, sandy, clean. The water is amazing. Its warm, clear and you can go out a good distance before it gets deep. This is the best beach I've ever been to in the Caribbean. You can walk for miles, although we didn't walk the entire beach. We took a glass bottom boat ride to go snorkeling, it was a great experience. There are many places to eat right on the beach within a short walking distance. Or you can venture out on the street side as well. To the right is a few minutes walk to Negril town centre where there are a few places to eat along with a mini mart and grocery store. We walked there a couple times, got some food and took a taxi back to the property since it was only a few dollars to do so. If you go left on the street you are within walking distance of food, a mini mart, shopping places. This side is much closer than the walk into the town centre. And since the mini mart that's on the condo property was never open it was necessary to go to another location for essentials. Overall its a great place, a great experience and we would come back here again. 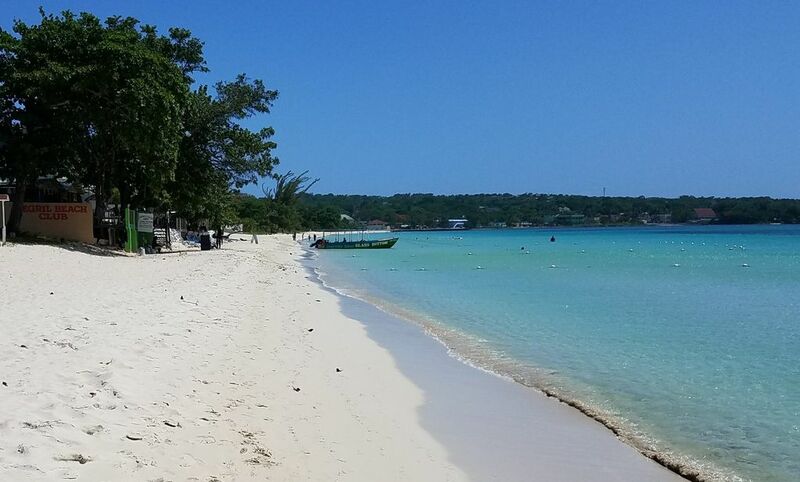 We enjoyed our stay very much at Negril Beach Club. Yvonne, our host, was wonderful. Everyone who works at the club and the beachfront businesses were very pleasant. My son got a beautiful custom piece of art from Octavius on the beach at the Club. We used the kitchen a lot and it had everything we needed for cooking. The beds were very comfortable. Great bathroom. Very clean. Really nice sheets and towels. Good vigilant security. One thing - the reservation said 'Mariner's Negril Beach Club' and the sign says 'Negril Beach Club' so we did some inadvertent sight seeing while trying to find it as we were looking for the word 'Mariners'. Mapping was unavailable on our phones but the full name was listed on a paper map (a GREAT thing to have there) so we found it. Great view and everything we needed. Nice beds, nice appliances, nice balcony. AC units for both main room and bedroom, and a couple of nice fans if needed. We recently stayed in this cozy little one bedroom condo on our 25th wedding anniversary trip to Negril. We loved that the location was perfect to experience the real Jamaica. We felt like locals ourselves and that is what we strive for on vacation is culture. I think we were maybe the first or second people to ever rent the condo and the only issue we really had was that the safe was not available for our use. We always like to lock up our passports and extra cash and such. We were hiding stuff in the condo or always carrying these items with us. I am sure this was just an oversight and that in future, the owner will address this minor issue. The bathroom could use an update but overall, we had the time of our lives and would rent it again.